DALLAS (AP) — Dirk Nowitzki hasn’t won a playoff series since leading the Dallas Mavericks to their only championship in 2011 and has watched the franchise’s steady slide to depths not seen since he was the fresh-faced rookie out of Europe 20 years ago. If Nowitzki’s record 21st season with the same team is his last, the superstar from Germany at least wants to be able to say he was there for the beginning of a turnaround. Those hopes are grounded in another precocious Euro transplant, No. 3 overall pick Luka Doncic from Slovenia, and second-year point guard Dennis Smith Jr., who can tell his new young teammate what it’s like to start an NBA career as a teenager. The Mavericks open the season next Wednesday at Phoenix. Winning now might fall a little bit more toward the older guys. Harrison Barnes was the first big step toward life after Nowitzki as the team’s leading scorer the past two seasons after winning a title and losing in the NBA Finals with Golden State. Center DeAndre Jordan, one of the game’s best rebounders, finally joined the Mavericks three years after backing out on a pledge to do so. Losing is getting old for coach Rick Carlisle, going into his 11th season with the Mavericks. He had just one sub-.500 record in his first 14 years as an NBA coach. The second of two in a row (24-58) was Dallas’ first 50-loss season since the last of seven in a span of eight seasons in 1998, a couple of months before Nowitzki showed up. The 40-year-old is expected to come off the bench with regularity for the first time since he was a rookie. The Jordan signing clinched it, since Nowitzki was considered the starting center last season. Shooting guard Wesley Matthews is the other starter along with Smith, Barnes, Doncic and Jordan. Nowitzki knows it will be different but is fine with it. The 19-year-old Doncic’s court sense and passing ability raise the question of who might be the better facilitator between him and Smith, who was third among rookies in assists last season. This much figures to be true: the Mavericks have a promising point forward in the 6-foot-7 Doncic, likely to be listed as the starting power forward. 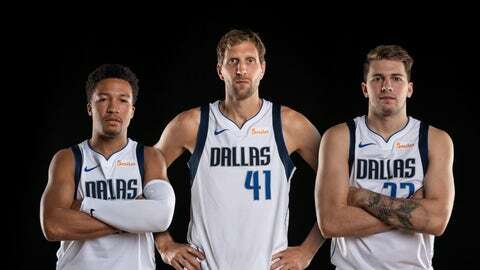 The Mavericks weren’t good enough to make the playoffs in the West the past two seasons, but bad starts sapped any hope early both times (2-13 followed by 2-14). With a brighter outlook, it’s more important for Dallas to avoid those miserable early records.